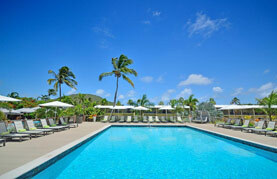 St. Kitts is a paradise of modern luxury and relaxation. Diverse beaches of white, gray, and black sands provides for a perfect complement to the rain-forested mountains. The reef-protected waters makes the beaches of St. Kitts ideal for swimming, snorkeling, and diving. The culture is very rich and vibrant, and you're sure to hear some tropical beats to groove to while sipping an exotic cocktail on one of their many beautiful beaches. Visit the colonial-era Georgian buildings of the capital, Basseterre, and its Victorian-style clock tower. Enjoy panoramic views of the Caribbean Sea at many of the luxurious resorts. You'll also find some amazing hiking spots in the rain forests and on their extinct volcanoes.